Loved it, such a fun read! The story was something I could so relate to and I loved that it wasn’t predictable. I wish I could have used Roman’s tips back when I tried online dating – would have saved me a lot of heartache! Great title - eloves me, eloves me not is the perfect vacation read – something light and funny that’s easy to pick up and put down as I move in and out of my lounge chair. Admittedly, as I got into the story, putting it down became harder and harder to do. A single woman’s uncompromising quest for real love in a virtual world takes you on a journey full of drama, danger and delight. eloves me, eloves me not is a poignant reminder of “girl power” and the unique gifts we receive from each of our friends – we all need a Chloe! Be prepared to laugh and cry and then laugh some more! 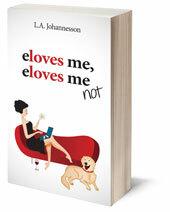 eloves me, eloves me not is a modern, entertaining story that progresses at a good pace. There are even multiple climaxes (which is always good). I’ve read the book AND I’d see the movie. A real and honest look at today’s dating scene and just how far we’ve come from the “old days” our parents spoke about. Throughout the novel I was drawn to one loyal, compassionate and loveable character… Dylan! That said, I would have happily gone on a few dates with Tommy . A surprising and enlightening glimpse into the world of online dating. This book is engaging and it creates vivid scenarios of what can happen when a conventional career-minded woman goes online searching for love. It had me in tears and fits of laughter. An upbeat novel with a not so typical ending – a must read”. Reading from the perspective of someone who has also traversed the perilous waters of on line dating, I readily identified with Kayte and her foibles. I think she and I may have even chatted with a few of the same men . And while I have yet to meet ‘the one’, her story gives me hope that there may still be good ones waiting for each of us. As a male reader, I found Kayte’s dating adventures entertaining and fascinating – even eye-opening at times! It was more than just an entertaining story however; the book explores some of the important themes about finding love and living life in the age of the Internet. Read it. Loved it. Waiting for book two. I enjoyed every minute of eloves me, eloves me not! It made the mundane commute to work everyday something to look forward to! I laughed and cried with Kayte, and was on the edge of my seat to see who the online dating merry-go-round served up next. Chloe had me reminiscing about my own involvement in my friends’ online dating journeys, and laughing at the memory of our escapades. Do yourself a favour, grab a glass of wine, get comfortable and join Katye on her 21st century quest for love. Woof woof bark woof, bark, grr, woof woof. Bark, bark Dylan… woof, woof bark, bark. Grr! Judy, working on that. More soon.